Is Equifax too big to fail?! Last Friday, word began filtering out of Beijing that the authorities there plan to shut down the country’s bitcoin exchanges. 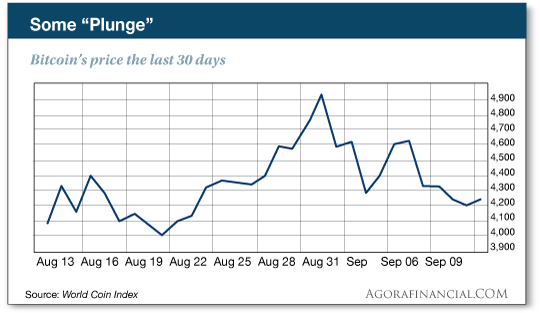 The “plunge” that resulted has taken bitcoin’s dollar price back to levels last seen… uh, three weeks ago. That was the third paragraph. Deeper in the story, it turns out a lot of crypto trading in China has been moving off the exchanges anyway. People are trading with each other privately — “peer to peer,” as the tech-savvy call it. Whatever. It’s a lot more exciting to suggest THIS IS THE END FOR CRYPTO. More eyeballs, more clicks. Besides, who reads beyond the third paragraph before sharing their opinion on social media these days? Oh, well. We had to knock down some of the crepe-hanging last week too, when China’s central bank banned ICOs — the initial coin offerings comparable to an IPO for a stock. Sure enough, it’s turning out to be a speed bump for the best-of-breed ICOs. [Ed. note: The ICO we’ve been telling you about since last month — the one Lou Basenese is so excited about — will “go live” tomorrow morning. If September’s supposed to be a terrible month for stocks, it hasn’t played out that way yet. Historical data notwithstanding, the S&P 500 notched a record close yesterday, and it’s inching higher into record territory as we write at 2,493. Gold is losing a bit more ground at $1,329, although it still looks great compared with two months ago. 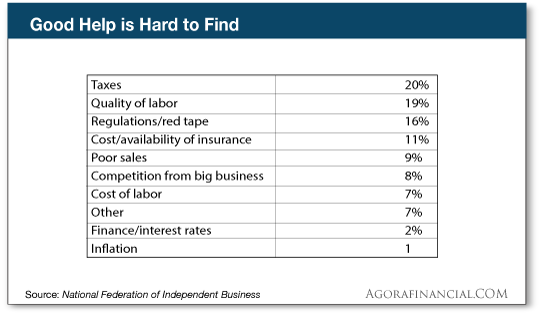 Small-business owners appear to no longer care about progress in Washington on tax cuts or Obamacare repeal. The monthly Optimism Index from the National Federation of Independent Business clocks in this morning at 105.3, the highest in six months. “Consumer demand is very strong, and the regulatory relief has been dramatic,” says NFIB president and CEO Juanita Duggan. For the record: The national debt has “finally” topped $20 trillion. After the president signed a bill last Friday lifting the debt ceiling till mid-December, the U.S. Treasury re-ran its numbers. The debt jumped to $20.16 trillion. Just for the heck of it, we compared that with a year earlier. The total was $19.48 trillion. That makes for an increase of $680 billion in 12 months — a rather higher figure than the official “budget deficit” figures you hear coming from Washington. “The beginning of the end of the petrodollar system,” is how Jim Rickards describes the news from Beijing. Last week we mentioned how the Chinese are planning to launch an oil futures contract priced in yuan… and convertible to gold. Thus can Russia and Iran do an end run around U.S. sanctions. Jim says it amounts to “a new international monetary order that does not involve U.S. dollars. “It has several parts, which together spell dollar doom. The first part is that China will buy oil from Russia and Iran in exchange for yuan. The yuan is not a major reserve currency, so it’s not an especially attractive asset for Russia or Iran to hold. China solves that problem by offering to convert yuan into gold on a spot basis on the Shanghai Gold Exchange. This straight-through processing of oil to yuan to gold bypasses the dollar completely. For more than 40 years, Washington has ruled the global monetary roost by propping up Middle East dictators in exchange for those dictators pricing their oil in dollars. That entire system is now at risk. And it’s not just the Chinese, Russians and Iranians who are in on it. Last week China hosted a meeting of leaders from all the BRICS nations. In addition to China and Russia, this group includes India, Brazil and South Africa — 45% of the world population and 25% of the global economy. The BRICS leaders endorsed China’s plans to price oil in yuan convertible into gold. Heh, there’s only one global reserve currency — the dollar. At the risk of being labeled Russophiles, we dig Putin’s penchant for dry humor. Will Equifax need a bailout thanks to its colossal data breach? We’re not done talking about China today. We just heard from a reader who says he’s on his fourth or fifth visit to Beijing since 2008. “The good side of cashless, in China at least,” is his subject line. “It is exactly three years since my last visit and so much has changed,” he writes. “Before there were few bicycles and all were privately owned. Now there seem more bicycles (rentals, and I counted four companies so far) than there are cars. Also rental scooters and car shares. I’ll get to why that’s important in a bit. “Now there is WeChat and Alipay everywhere. There is literally nothing you cannot do or buy with it. It is super-simple to use. You simply scan the merchant QR code, enter the amount and authorize payment. The merchant is paid instantly and you are debited instantly. Everything has a detailed record. You can tie a bank card, credit card, gift card, etc., or just have a family member send you money to recharge. “Those bicycles, scooters and car shares mentioned earlier? They all have QR codes. Just scan the code, you are authorized and they unlock. Away you go. I have only used the bicycle so far. Really super-cheap. A 10-minute ride across town cost me only 1 rmb, or something like 15 U.S. cents, and I can leave the bike anywhere and not have to find a special location. I have used WeChat Pay to pay for groceries, meals, clothes, etc. “Now, it must be noted that you need a minimum of a Chinese phone number to use many of the features. No big deal, as you can go to any mobile store such as China Mobile, China Unicom, etc., and simply buy a sim card for your phone and you are good to go. In my case I just registered using my mother in-law’s phone number and had my stepson send me a hongbao money transfer to get started. “The U.S. has nothing even close!” our correspondent goes on. “Apple Pay and even bank card pay by phone are too complicated. You have to be ready, the terminal has to accept it and you still have to sign and or enter a pin. It’s a joke, as simply swiping or inserting your card is still faster than any U.S. digital wallet or phone pay. Oh, and very, very few places are set up to accept it yet, so even if you want to try to use it, most times you cannot. “WeChat pay also allows for utility payments, charity donations, loans, airlines, subways, taxis, buses, hotels, even the ability to buy high-interest bonds, etc. It’s as if China in just three years has leaped ahead of the U.S. financial and commerce markets by at least 10 years. Projecting a bit much, are we? Look, we’re the first to acknowledge a proliferation of shady characters in the cryptocurrency world. 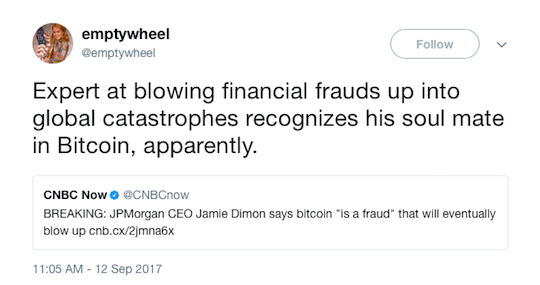 But to use bitcoin as a proxy for all cryptos and declare them all fraudulent is preposterous. And frankly, we find the timing a little, well, curious. With only hours to go before the launch of a game-changing initial coin offering? Maybe the establishment is running scared… because of this?